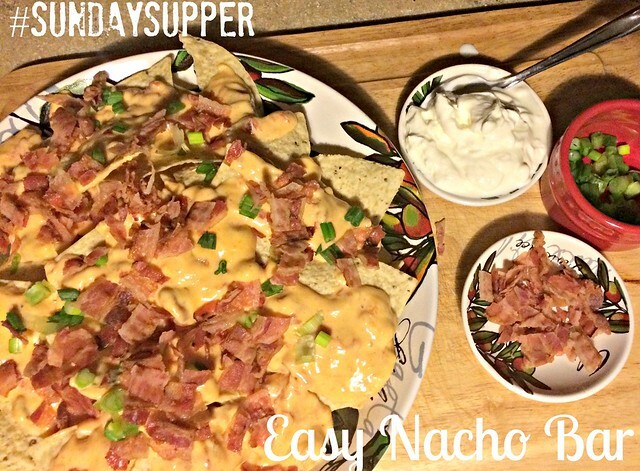 Easy Nacho Bar for a #SundaySupper Game Day! Happy Sunday everyone!! Even though New England’s Football team didn’t make it this year to the Superbowl I still wanted to take part in this weeks even for a few reasons. One, I miss #SundaySupper, I took a few weeks off and two because of the theme!! Game Day treats! This event is being hosted by Heather over at Hezzi-D’s Books and Cooks. Thanks for hosting Heather! I will use every and all excuses to make snacks! I love making snacks, a bunch of things to pick on when having family and friends over. I’ll admit, football and I, we don’t get along. I’ve tried numerous times to understand the game, I’m not sure if it’s because I just like to talk too much and I can’t pay attention or if I simply just don’t get it! I don’t mind baseball and hockey because I get it……I don’t mind watching a game here and there with my husband, however using every excuse I can to prep, cook and eat some awesome snacks, makes me like any Game Day! Hey it’s a win win for anyone that comes to my house for a game, they know they will always get yummy goodies. When I entertain with friends or family I often put together a few dishes because I just love making Appetizers. The Appetizers posted here are only maybe a third of what I’ve actually made, however I do tend to always make the same ones. That brings me to the dish I decided to share with you today. Who doesn’t love a good nacho?? So why not set up a Nacho bar and serve toppings so everyone can make them to their own liking. I’ve served this a few times now at family parties so let me walk you through what I do. For the main ingredients you only need three things. A bag of tortilla chips, a block of Velveeta cheese and a can of Rotel tomatoes with green chili’s in them. (you can by Rotel diced tomatoes without the chili’s as well, I’ve made it that way too.) Simple isn’t it??! You name it you can put it on Nacho’s! I made a plate for my husband and I for NYE this year, I just used what I had in the house and put it on a large serving plate and we dug in. When serving it to friends it’s nice because they can put whatever toppings they like on it. Hey some people can be picky with their Nacho’s, me not so much. This is a good excuse for me to use my cutesy small dishes I have! Now dig in! Grab your grocery list because you are going to want to make some of these dishes for your next Game Day Celebration! It’s not too late to go pick up some things now for today’s game! Gah, I want nachos but this year we are eating a tad healthier and so no glorious nachos for me. 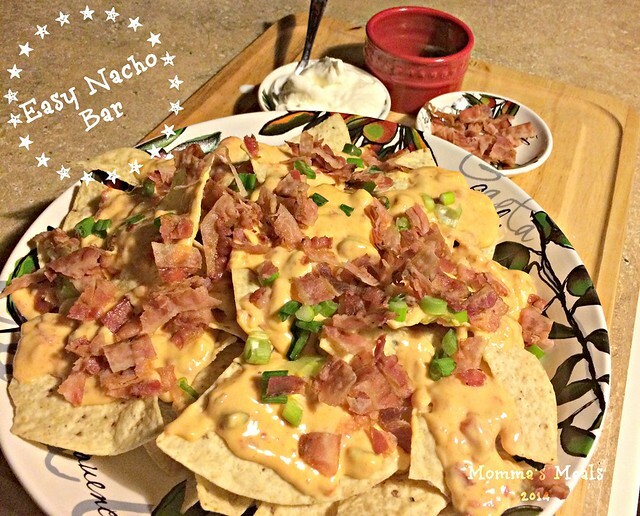 But I will definitely have to make these when I have a nacho craving I can finally satisfy! Mmmm I love nacho’s and yours are perfect for me. I love the nacho bar idea!! Having nachos on the table is a must!!! Love this! Go Hawks! Oh you have me drooling. Nachos are such a weakness of mine… Thanks for posting! Such a great idea to have a bar of options for guests to make their own nachos…. I love this idea since I’ve always just made them my own preferred way, but firmly believe that making everyone’s tummies happy takes first place over my preferences….this is certainly one way to make everyone happy with all of the different choices offered! Nachos are a big deal in this house!! We all love them and yours look fantastic!! What a great idea and so fun and cute! I love nachos and I would love to have one of these bars at my next party or maybe even for dinner?? Great idea for #SS game day food. I’ll be using this one for my next gathering. Nice cooking with you through Sunday Supper. Ok, I’m now officially hungry. These look amazing, and I love the idea of a natchos bar. The kids would love it too. I’m with you on the whole sports thing. I don’t really understand the game well enough, even after all these years, and look at it primarily as a social / food event. Basketball I understand better because we learned the rules in gym when I was growing up. I love, love the idea of a nacho bar! I’d be grazing ALL day long!!! I’m totally craving nachos today too! Thise look fantastic. I love the nacho bar idea! REALLY clever! Great idea, nachos are my husband favorite. Nothing like having easy things to make for a crowd. And this way everyone gets to make their nachos just how the like them. Nacho bars are perfect for a game, especially if you have picky eater in the bunch! I have never met a nacho I didn’t like! Love the idea of a nacho bar. This is a great idea, not only for Super Bowl parties, but any gathering! Awesome way to feed a party crowd!